Cinedelphia usually ignores the promotional efforts of the major studios, but this event is kinda fun/weird (and we really dig that homemade Thor poster to the left). 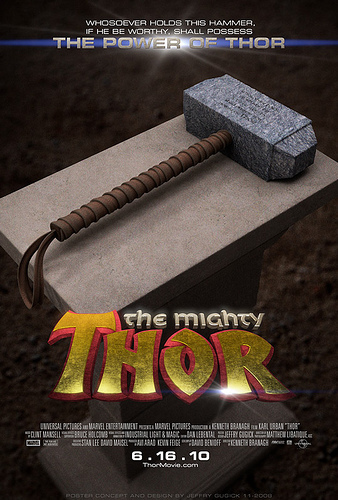 This coming Saturday (4/9) and Sunday (4/10) from noon to 4:00 PM Thor fans can attempt to lift the mighty Mjolnir and, if successful, win a trip to the film’s premiere. The event will be held at the Hot Topic in the King of Prussia Mall and will be accompanied by the sounds of WMMR’s Nick & Casey. If anyone can make it out there, pleeeease send us photos!